For the past few years I have been posting my thoughts on the culture and warfare of ancient greece on a variety of lists. I decided to create this blog to enable me to go into greater depth, and I hope clarity, than I could in that format. I welcome any questions you might have. If I cannot answer them myself I will locate the appropriate resources. My goal for this blog is to attempt to strip away some of the faulty preconceptions and “common knowledge” that are prevalent about Sparta and ancient greece in general. 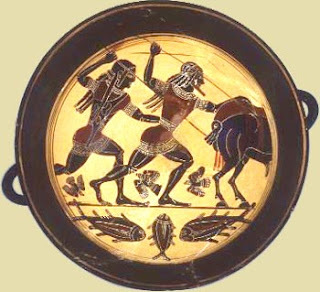 Spartan man and youth hunting boar 555 b.c.